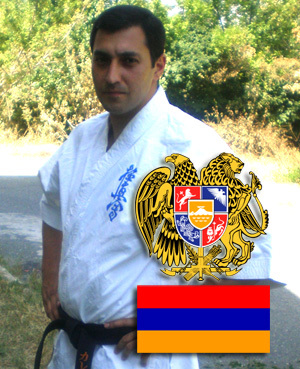 OYAMA International Karate Federation accepted Sensei Karen Zhamkochyan 3rd dan from Armenia. Sensei Karen is 31 years old. He is a graduate of the Armenian Pedagogical University. He has been practising karate since 1993. In 1997, in Iran, he passed a black belt test under Shihan Hatsuo Royama. In 2003, in Russia, he was promoted to 2nd dan by Kancho Toru Tezuka. His 3rd dan promotion took place in Georgia where, in 2006, he was promoted by Kancho Yoshikazu Matsushima. In 2003 he created his own Dojo in Armenian Capitol, Erevan. He is teaching over 30 students.